Born in Zaire, Fabrice Muamba is a 23-year old soccer player, a mid-fielder for the Bolton Wanderers in the Premier League in the U.K. On March 17, 2012, he collapsed on the soccer field, mid-way through a match with Tottenham. This short video clip from the game’s broadcast shows the event, the prompt attention from trainers and medical personnel, and the shocked reaction from the crowd in attendance. Muamba was apparently on the field, but away from the game’s action, when he suddenly collapsed. Witnesses reported that he simply fell to the ground face down without doing anything like extending his arms to break the fall. While he was still on the field, he received CPR, with both mouth-to-mouth resuscitation and chest compressions. By report, he received 2 defibrillation shocks on the field, another in the tunnel leading from the stadium, and another 12 in the ambulance on the way to the hospital–all unsuccessful. Further details of Muamba’s hospital course and evaluation have not yet been reported, but his fiancee, Shauna Magunda, tweeted a picture of Muamba earlier this week that shows him in the hospital sitting up and smiling. This is certainly good news. 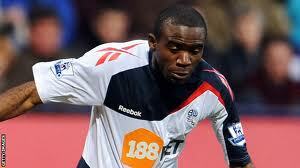 It’s been reported that Muamba had previously undergone cardiac screening, but details have not yet been provided. At this point, we can only speculate about the cause of his sudden cardiac death episode. There are a variety of potential causes, including hypertrophic cardiomyopathy (HCM) among others. Perhaps more information about his case will be forthcoming. We know that the success rate for resuscitation from sports-related SCD is poor (<20%), so it’s terrific that Muamba is a survivor.